The information in Societies Act FAQs is intended for British Columbian non-profit organizations seeking to understand the requirements of the new Societies Act, SBC 2015, c. 18, and compliance and transition under this new legislation. 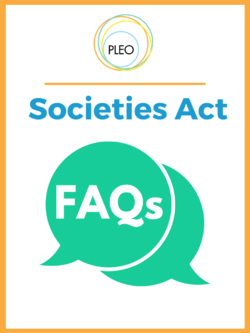 Societies Act FAQs is prepared by Law for Non Profits with the help and support from the University of Victoria Faculty of Law Business Law Clinic. They are intended as a support for non-profit organizations in British Columbia undergoing transition to BC's new Societies Act, SBC 2015, c. 18, following its proclamation later this year. More information and workshop and webinar schedules are available on lawfornonprofits.ca. Learn more about Clicklaw Wikibooks. Law for Non Profits is an initiative of the Pacific Legal Education and Outreach Society (PLEO) and is funded by the City of Vancouver, the Law Foundation of BC, and the Notaries Foundation. This page was last edited on 6 December 2016, at 20:00.